I am the owner of Workouts 24/7. I am married and have three beautiful daughters. I have been a businessman for over 25 years, so owning my own business in an area I am passionate about has always been a goal for me. Over the years I have belonged to a number of gyms throughout upstate NY. I understand the gym industry and have done extensive research and planning to offer the optimal gym for my local community. I choose to be hands on owner creating personal relationships with our members. My goal is for all our members to take pride in their gym while becoming their personal best. A special thanks to three people who I owe a lot to in making this dream of mine come true. My lovely wife Sandy for always being so positive every day of my life, and never letting anything stop me from continuing my dream of owning a Health Club. Eric Paparro for helping me envision what my Health Club could be and never saying no whenever I called upon him. Here at Workouts 24/7 we want to see people maintain a healthy lifestyle or completely change their lives. Our hope is to help our members achieve their fitness goals in a safe, clean and updated environment. Our 5,500 square feet of space is designed specifically for personal choice. We offer comprehensive fitness programs as well as cardiovascular equipment, strength training machines, free weights with plate loading. We offer a variety of group classes. As a 24 hour fitness facility members can feel empowered to achieve their personal fitness and health goals by understanding the benefits and value of daily exercise on their own time. 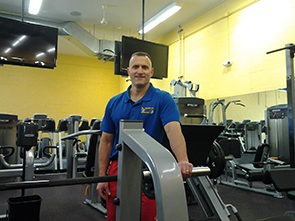 On staff we boast the area’s top Personal Trainers who will assist you while reaching your potential. Meet with one of our trainers to determine how to obtain and maintain a healthy lifestyle. Take a group fitness class and work out with other like-minded friends. These classes will allow you to bring your cardiovascular workout to new heights with rhythmic motivating music. We have something for everyone.